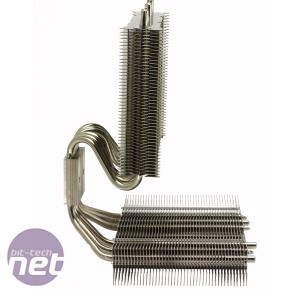 The design of many CPU coolers these days indicates a two-dimensional thinking pattern – blow air across a tower-shaped heatsink from front to back. 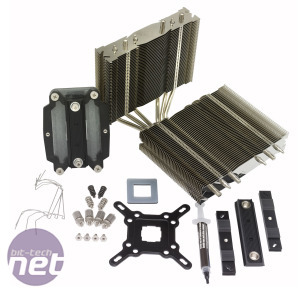 However, experiments with different designs have resulted in coolers with two fin-stacks, such as Prolimatech’s own Megahalems or Noctua’s NH-D14. Prolimatech’s latest offering, the Genesis, takes this one step further. The Genesis is huge, with one end of the bank of heatpipes snaking upwards to form the basis of a vertical stack of cooling fins, and the other end bending to form a horizontal section. Each stack comprises 46 aluminium cooling fins, measuring roughly 24 x 143mm, for a total surface area of more than 6,300cm2. This is decidedly less than the Be Quiet! Dark Rock Pro, which has a surface area of more than 9,000cm. 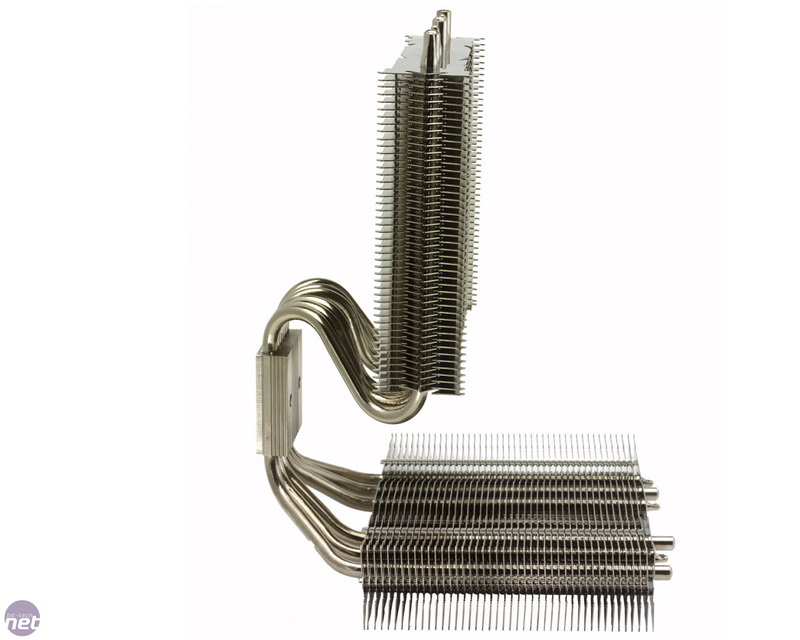 The six long nickel-plated copper heatpipes contribute a fair bit to that high overall price too. However, Cooler designs can be like the Kobayashi Maru – a no-win scenario; you either use a tower design to achieve low CPU temperatures but little VRM cooling, or a downdraft design to keep the VRMs and memory cool, but not the CPU. However, the two banks of cooling fins in their different orientations enable the Genesis to attempt both. The CPU contact plate of the Genesis is made from nickel-plated copper, and is well machined – we saw no gaps around the heatpipes that pass through the block, for example. Meanwhile, the top side of the contact plate is an aluminium mould on to which the mounting bracket fits. However, due to the cooler's unique design, the maximum dimensions of the Genesis are intimidating. Measuring 160 x 150 x 215mm (W x D x H), it will totally dominate the interior of any PC into which it’s fitted; a process that’s surprisingly easy. Whether you fit the Genesis to an AMD Socket AM3 or an Intel LGA1155 motherboard, both use a similar method. Before the cooler is fitted, you first need to attach a backplate and mounting platform. Mercifully, this is accomplished in an entirely tool-free fashion, and although easier with the motherboard removed from a case, it’s perfectly possible to manage inside a case with a backplate cut-out. 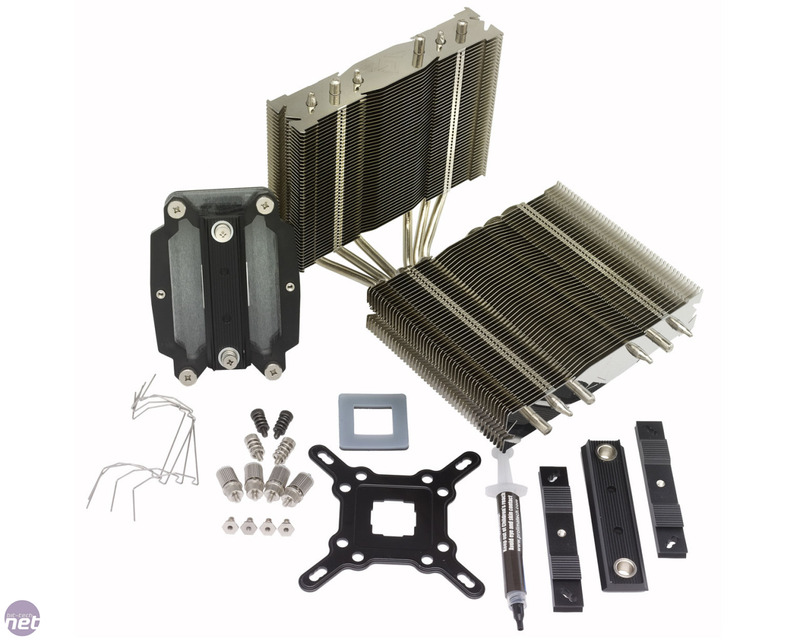 With the mounting platform secured, you can then drop the cooler into place, before clamping it down with the appropriate crossbar that fits over the cooler’s CPU contact plate. The crossbar is secured using sprung screws to increase tension, and requires a Phillips-head screwdriver. Once the cooler is fitted, you’ll need to add your own fans, as there aren't any included with the Genesis. Up to three can be fitted at once (two on either side of the vertical stack, and one on top of the horizontal) and you can use 120mm or 140mm fans. The mounting wires provided by Prolimatech are absolutely brilliant too; it was simple to slot them in and clip on the fans securely. This is a welcome change from the rage-inducing, finger-torture mounting wires included with other CPU coolers. 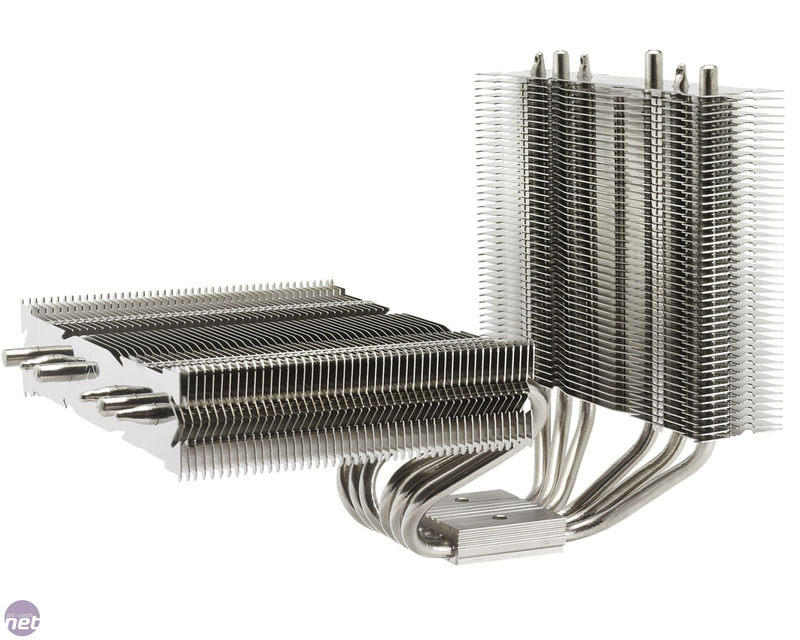 Antec's new CPU cooler targets the high-end air cooling market.